This macaque was sneaking up on an unsuspecting tourist in hopes of stealing his food. His efforts were thwarted since the tourist didn’t have any food to swipe. Photo taken at the Batu Caves in Malaysia. This entry was posted in Travel Photos and tagged Animals, Asia, Humor, Kuala Lumpur, Life, Macaques, Malaysia, Monkeys, Nature, Photography, South East Asia, Tourists, Travel, Travel Blog, Travel Journal, Travel Photo. Bookmark the permalink. I think the tourist was more upset. Beautiful shot! Not particularly fond of thieving monkeys though, they can get really vicious. I was scared of them and kept my distance. That would have freaked me out. They are cute from afar, but on your head! Yikes! Nice picture, TBM. 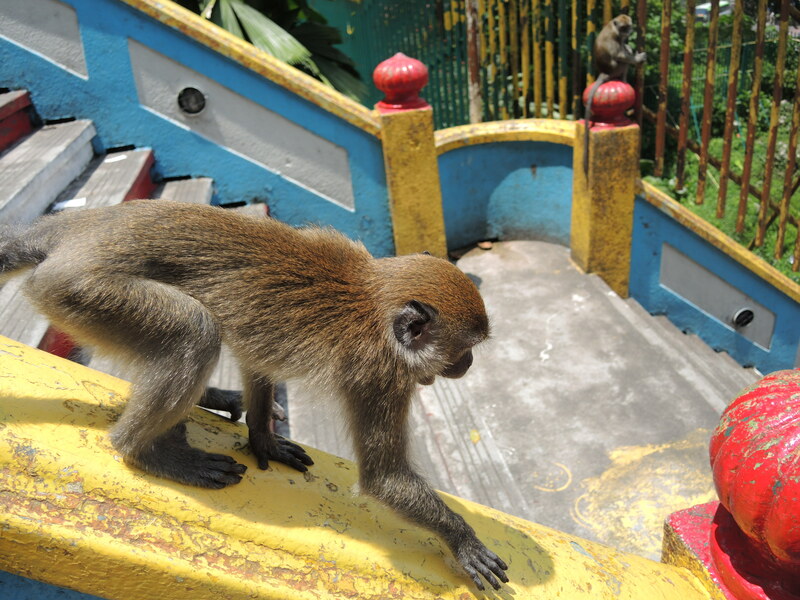 The monkeys here are like that – trying to steal food from people. I saw that they are persistent. Little devil. 🙂 Nice colors! I loved the colors in Malaysia! He is really quite cheeky! Yes and a little intimidating. I don’t know what it is about monkeys, but they scare me a little. I agree about the vivid colors~very nice! From my experience in Malaysia and Africa, monkeys are always plotting to steal things, which makes them very intimidating. They don’t like to be denied. I love food, but these little buggers scare me. I would drop my food and run the other way. clever little fellows – cousins i guess they are to us.